The year was 1973. The guest speaker at the annual St. Mary Of The Assumption Church Father-Son breakfast was a Mr. Fred Shero, coach of the Philadelphia Flyers. I don't remember anything about that Sunday morning except for the Flyers bumper sticker he signed that I stuck on my air conditioner when I got home. And I did start watching hockey games that year. What a great time to start. They went all the way that season and took the Stanley Cup in 1974. Much to the surprise of the school 90% of the kids like me went downtown to the Broad St. parade. That summer we started playing street hockey. The following year they did it again. More dramatically than the first year. The day of the parade the students were expected to be in class or a visit from the principal to their home was expected. So we didn't get to go. I would have given my right arm for any autographs. Dave Shultz, the toughest hockey player ever was our hero. My cousin convinced his parents to send him to a hockey camp that was being run by Ray Schultz. Yes, Dave's brother. Not the guy from the islanders who wasn't born until 1976, was running a hockey camp. My cousin was so hyped up about meeting Dave Schultz's brother :) And I am happy to say he came back from camp with two things for me. A personalized autographed picture from Ray. How cool is this :) And he also got a few of these. Not personalized like the one from Ray. But it was the autograph of the main Broad Street Bully! My cousin said there was hope he would show up at the camp but that never happened. Ok Sherman, jump the wayback machine up to 1994. Going to the movies with a friend at a local mall as it was closing. Sports card show, main attraction, Dave Schultz! As we were walking in, he was walking out. 20 years had changed the Hammer but there was still a bit of awe and I didn't have the presence of mind to ask for an autograph. 1996, A coworker tells me her husband's hockey team is playing the Flyers old timers for a charity type game. Asks me if I want to see them play for a $10 ticket. 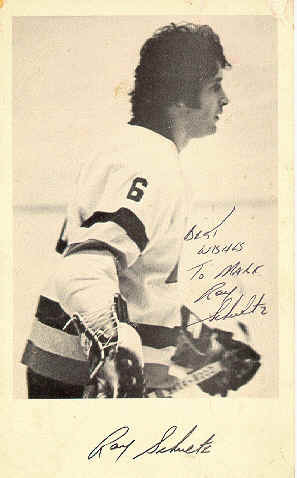 Sure, I head over to New Jersey, And got to watch Rick MacLeish, Bob Kelly, Bill Barber, and Dave Schultz lose :) Along with the obligatory Hammer roughing ready to fight act :) And during the party afterwards, Finally walking up to Dave Schultz 23 years later and getting an autograph. Now if I could only find it. Amazing I still have the two older ones. 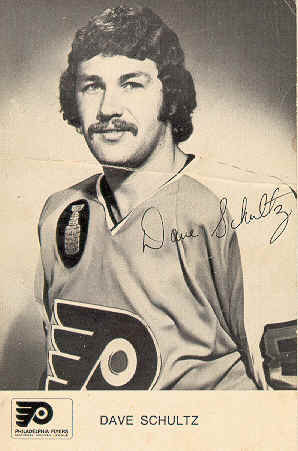 People came looking for Philadelphia Flyers 1974 Broad Street Bullies Dave Schultz or his unknown brother Ray Schultz stuff.